← Holy Crap! 19 Miles! 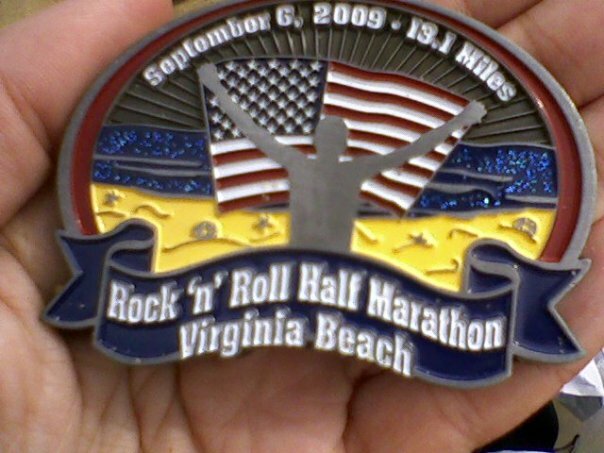 I signed up for the VA Beach Rock n Roll Half Marathon again this year. This was the first half marathon I ran (and this year it will be my fourth), and last year I had such a hard time during training, thinking I would never be healthy in time to complete it. But despite being bedridden for a week and a half, I picked training back up and finished with my goal pace of 12 min/mile (I had been slowly getting faster, but it was a huge setback that brought my pace back to super-slow). It was my one pre-30 goal, and I was scared I would never be crossing that finish line. Amazing how far I’ve come since. I decided to post this here, since so many people are dealing with unexpected injuries now, and if this can bring hope to one person, so be it. I signed up for the VA Beach Half Marathon in April. I knew training would start at the end of June and I was ready. Two weeks before my 30th birthday, I was going to cross that finish line, running a Half Marathon, without the need to stop and walk. It was a great, attainable, pre-30th goal. And I was training. I didn’t miss one training run. Running 4 times a week had a hit on my social life, took a toll on my friendships. Weeknights were no longer my own. Volleyball league was given up. But I WAS going to finish it. Sunday, my parents arrived in the country, and I proudly announced how on Saturday I ran a total of 11 miles — 8 miles in my training run in the morning, then 3 miles that night at the Crystal City Twilighter 5k, beating my time last year by 4 minutes. They met Karl a couple of hours before dinner (it went great!). My sister was making a chicken and broccoli casserole, with a creamy sauce. We were starving. It was finally ready. I was sitting by the table, when she removed the casserole from the oven and said “I don’t think it’s ready” my mom countered “it is ready” I looked through the glass dish that was now a few inches from me and proclaimed “I can see it bubbling” and just then, it slipped out of my sister’s hand and the contents of the dish landed on my lap, a few inches below my skirt. I got up quickly, and screamed. A very much primal scream. I was in agony. Everyone urged me to the cold shower, where while rubbing it with ice, I could see the humongous blisters forming. My sister was in tears in the kitchen, while my brother in law decided to call an ambulance, to be on the safe side. The paramedics arrived, and when they saw the blisters on my lower thigh going down my knee, they immediately asked to take me to the hospital to treat my 2nd degree burns. My Sunday night was spent in the hospital. As soon as I got in, they started pumping meds through the IV. Anti-nausea medication, anti-inflammatory, and a pain reliever (“like morphine, but stronger” said the nurse). The anti-nausea medication didn’t work, so I needed another dose of it. The doctor was finally ready to treat the burns. Do you know how doctors treat burns? By scrubbing off, with a wet gauze, all the blisters and the dead skin. You know, when you’re trying to get stubborn stain out of your t-shirt? Yeah, just like that. Needless to say, the pain medication wasn’t enough. The nurse pumped more of it through the IV. Then I needed more anti-nausea medication. This is what being high feels like. Unfortunately, the second dose of pain medication still was not enough: when the doctor came back to finish rubbing off the blisters and dead skin, the pain was just as unbearable the second time around. My dad, who had followed the ambulance with Karl, claimed I almost broke his hand off. Finally, at almost midnight, I was being discharged. My biggest concern to the doctor? “How soon can I run?” He said as soon as it’s not too painful to do so. Having no pain at the time, I thought I could pick training back up in a couple of days. On my way out of the hospital the nurse catches me and said she forgot to give me a tetanus shot. I lift my shirt sleeve up, and she gets it done. I could barely walk, I was so out of it from all the meds. Got home, emailed work that I couldn’t be in the morning, and went to bed. Now it’s Thursday and I still haven’t made it to work. The medication knocks me out most of the day. The pain is excruciating, I’m on 4 different prescription meds, plus a prescription cream. I can only (and barely) walk with a limp. Twice a day, I’m supposed to wash the burn with soap and water completely removing the cream, and that only makes the pain much worse. The burn is supposed to be covered until the scabbing is gone. Of course, no scabs yet, so who knows when I can finally walk normally. We’re a month away from the Half Marathon, a month and a half to my 30th. I highly doubt I’ll be able to run anytime soon. And that one goal I had before 30? Well, it’s getting further and further away from my reach. So after the other post I have come to terms that there is only so much you can control. You can do everything right, and life might still throw you a curve ball. I missed 6 days of work after the burn, since I was in incapable of walking more than a few feet for 8 days straight. When I returned to work, I was still limping and in pain meds. A week after the burn, there had been no change. After the doctor suspected a nasty spot was the start of an infection and prescribed antibiotics, in just a few days the improvement was visible, and my skin finally started healing, little by little, making me feel more human again. At the end of the second week, I was finally successful in finding a knee brace that would keep the bandages in place (since it was still an open wound that needed to be covered at all hours) so I could run. It has been hard. REALLY hard. Somehow, 2 weeks barely walking, when most days my longest walk was from the bed to the couch, my endurance got shot, my body got weak. Even though I was consistently running prior to the burn, all of a sudden I could no longer keep up. The heat, which I had acclimatized to, started bothering me again, leaving me out of breath after a few strides. With only a few weeks to the Half Marathon, I didn’t have the luxury of building up my endurance again, and I had to jump right back into training. And I couldn’t run it all. My first attempted run was supposed to have been for 10 miles. I felt wonderful during the first two miles, then exhaustion hit me and I had to walk. But after a couple of minutes walking, I could run again. It took me longer, even my running pace got (as if it was possible!) slower, but I still finished the 10 miles, even if it wasn’t all running. This was the first time since the burn that I had hope. I accepted the fact that I couldn’t run the Half Marathon, but I now know that there is no doubt that I can finish it. And so I’m back at training. Some days, like yesterday, I can run for an hour straight and not have to stop. Other days, after every mile I need a short walking break. Saturday is supposed to be my longest run ever. I’m supposed to go out there and run for 140 minutes. I know I won’t be able to run the whole time. But I do know that I’ll be able to complete the time. Maybe, by the time the Army Ten Miler comes along a little over a month from now, I will have regained my endurance, got my body strong again, and I can run the 10 miles. But for the VA Beach Rock n Roll Half Marathon, I might not be able to run it all, but in a little over 2 weeks from now, I will cross that finish line and get the medal I so rightfully deserve. Miles, that is. 11.7 miles. That I ran on Saturday. Non-stop. Still talking towards the end. Sure, I ran slower than my usual pace, so it took me a few more minutes to complete it. But I ran the whole thing. Could I have done another 1.4 miles and completed a half marathon on Saturday? Absolutely. The weather wasn’t as hot, the drop in temperature certainly helped (amazing how a high of 80 degrees vs a high of 90 degrees makes the run much less torture). But being able to run almost 12 miles, without needing a walk break? It was the exact boost of confidence I needed! Not only I can finish the Half Marathon, but I just might be able to finish running it all! And that pre-30th goal? Will be accomplished after all. Yippee!!! Big props to my friends running the Marine Corps Marathon this October… While I officially started taper, our group training run this weekend for the MCM is 3 hours long. Ick. I did it! At my slow 12 min/mile pace, but my goal was to finish, my second goal was to be able to do so at a 12 min/mile pace. And I got them both done. A month ago, I didn’t think I was going to be able to run it at all. Heck, a month ago I still couldn’t walk, and I was limping in pain. 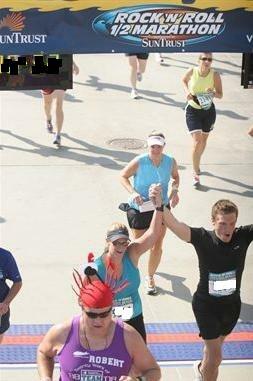 Karl ran with me the whole time (“we’re a team” he says) and we crossed the finish line together. Next year? My goal will be to finish in front of anyone wearing something stupid. There were 11 of us down at VA Beach. Karl and I went camping, since none of us wanted to spend a lot in hotels (the hotel room cost literally 10 times more than a campsite). Some of the group camped, others shared a hotel room. It was a blast! The fastest of the group finished in 1:30 (a 6:56 pace! ), the slowest finished in 2:50 — but we all finished it! It wasn’t easy, and the last two miles were the longest miles I have ever ran (and by then, the sun was beating down on us). Karl and I stuck around for a couple more days to enjoy the beach, only to be greeted with non-stop rain on Monday and Tuesday. At points so strong, that there was flooding in the area. But we caught up on sleep inside the tent, which is now drying out in my living room. what an amazing story. my god. how are your legs now? scarred? OUCH. Whoa, I’m glad you healed and could still run! Are you camping again this year or staying at a hotel? We’ll be at a hotel Friday-Tuesday. My husband doesn’t run but he comes along for the beach, bars and music fest! This year we’re staying at a hotel. We booked it when we were in town in March for the Shamrock Half, so we’re not paying as much as they’re charging now! You are incredible! Thank you so much for sharing those posts again. I had chills reading about your finish. I am running the va beach rnr on Sunday. It is my first half marathon. I am super excited and reeeallly nervous. I have 0 expectations for the race, just to finish. If I have to walk a water stop or two I will not beat myself up over that. I hope Earl comes early and cools things off so the weekend and concert are still fun. You’ll be fine! And there’s nothing wrong with walking water stops — I find that it actually helps, since you can properly drink water that way and not mess up with your breathing pattern. What an inspiring story…thank you for sharing! Thanks, Melissa! Running it this year without the pressure of being “the” race will be much nicer!